A big time mistake by JR Smith costs at least the game one to the Cavs and probably some of the suspense of these Finals that the Warriors won by a sweep. 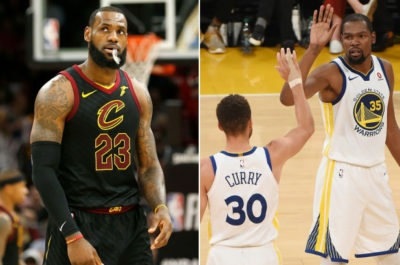 Now, a lot of questions have raised about Lebron’s legacy, Warriors’ place in NBA history. We’ll try to answer these questions and some of the others that we’re asking right now. 1. Is Lebron better than MJ? So much has been said about Lebron’s performance in these playoffs where he averaged 34pts 9rbds 9as. Of course, Lebron has beaten some of Jordan’s records and is an extraordinary player, probably one of the top 5 player in NBA history. Best scorer ever in the playoffs, steal leader, third best passer, sixth best rebounder. But his all around game can’t hide the truth. In nine Finals appearances, LBJ only won three times. No matter who the opponent is and who your GM recruit, you have to win to be the best and Lebron has lost too much. Some may think that the Warriors are unbeatable but three of their four major pieces have been drafted, with none of them drafted in the top 7. I also hear about how LBJ is a far more versatile player than MJ, but MJ’s averages of 6.4rbds 5.7as and 2.1stls in the playoffs prove he was much more than a scorer. Between 1992 and 1998, Jordan won the title in every complete season he had. He was a fearless defender who would never have some of the lapses LBJ can have. Above all, Jordan knew how to seize the moment, expose his greatness while the King let too many opportunities slip through his hands. History remembers the winners, and whatever record LBJ breaks, he may never be recognized as the winner is Airness was. 2. Where do the Warriors rank as a team in NBA history? 3. Can KD be considered a winner? 2016 Western Conference Finals, game six. OKC is playing in his own arena. A win can lead them to the NBA Finals. They are ahead the whole game but on the Warriors team, one player doesn’t want to end his season. Trailed by 8pts at the beginning of the fourth quarter, Klay Thompson helps his team stay in the game by scoring 14pts until this three pointer which gives the final lead and the victory to the team from the Bay. By losing this game and deciding to join the previous champion thereafter, KD has erased any opportunity to be the equal of the Jordan, Kobe or Duncan. That doesn’t mean he’s not an incredible player but he chose ease while he could have be more respected by rising to the challenge. The Warriors are Steph Curry’s team, KD is just an addition to it. 4. What will be Lebron’s next move? Lebron must be very disappointing about the way things went with the Cavs and now that he’s a free agent, potentially every NBA team is a suitor. Among these suitors, three or four may end up being serious destinations. Boston has been considered as they have the players for a sign and trade, but does Lebron want to reunite with Kyrie? Philly is another opportunity but, even if Simmons is signed with James’ partner Klutch Sports Group, how could both Lebron and Simmons play together? Simmons’ lack of outside shooting would need Lebron to play off the ball and let the Australian forward be the main ball handler. The most probable destination would be Los Angeles where Lebron could pair with Paul George, a better shooter and someone who fits best LBJ’s style of play. Finally, as Lebron has emphasized the importance of the family in his decision, he could choose to stay in Cleveland. Cleveland would need to really improve its roster to be able to compete with the Warriors and the rising Celtics. 5. Can the Warriors be even better? As Klay Thompson and Draymond Green are entering their last contract year, The Warrior’s management has already announced it will offer contract extensions this summer. Yet, Green and Thompson’s father have expressed they will not sign this summer as it would mean huge financial loss compared to what they could get next year, when they will both become unrestricted free agent. Both players, cornerstones of the franchise, will probably seek max contract and thus, may have to leave…except if the Warriors decide to trade them before. And they already have a big target, Anthony Davis, whose contract will pay him less than $30 million until the 2020/21 season. That would give Golden State three more years to dominate the NBA. Davis would be the perfect fit alongside Curry and Durant and bring what the Warriors lack most, size. Davis has numerous suitors so let’s see if, once again, the champion can attract another big time superstar in the Bay.